Shortly after the split up of Sean Dowdell And His Friends?, Sean met a bassist named Jonathan Krause through Sean's brother and they decided to form a new band. They put up an ad on Phoenix New Times to find a guitar player and vocalist and found a guitarist named Steve Mitchell. They tried out a few different singers, but it didn't work out. After listening to the Sean Dowdell And His Friends recording, Steve suggested to try and ask Chester to come back and audition for this new band as well, so the band invited him and Chester joined the band right away. Originally, the band members were going to call themselves Lovelies Bleeding, but later decided to settle on "Gray Daze". 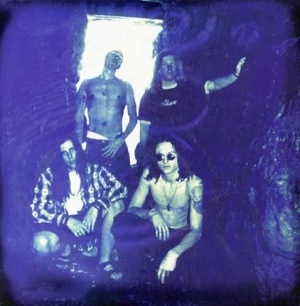 The band's first show took place on January 22, 1994 at Thunder & Lightning Bar & Grill in Scottsdale, AZ, and sometime after the debut show, in early-to-mid 1994, they recorded their first professional demo at the Conservatory Of Recording Arts & Sciences, a school for audio engineering and production education in Arizona. Steve was only in the band for about 5 months before he was fired for being "very temperamental and a bit unstable". After he left, they had a show booked at the Mason Jar and Jonathan's old guitarist from a past band he played with filled in for that show. His name was David Engelhardt and he didn't like the band. Eventually they put up another ad on Phoenix New Times and tried out many other guitarists until they found Jason Barnes. The spelling of their name was changed from "Gray" to "Grey" around the time that Steve left the band. Sometime in the middle of the year, Grey Daze recorded another demo at Scott Crowley’s apartment studio. He was a friend of Sean and the founder of another well known local band called "Nihil". The recording sessions for the band's debut album Wake Me began in October 1994, shortly after Kerry Rose became the band's manager. He was the owner of a Seafood restaurant where Jonathan and Sean worked at and liked the band after hearing the demos from the Conservatory Of Recording Arts & Sciences. They went into a local recording studio and started to work on the album with producer David Knauer. Kerry financed the recording sessions and CD printing, paying out over $10,000. He was able to get the CD in local record stores, and get the band a little air play on local radio stations. 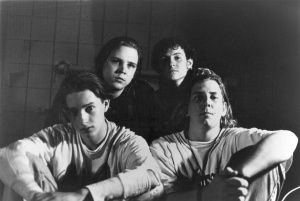 Around early 1995, shortly after the album's release, Jonathan Krause had left the band. It was his personal decision based on a combination of factors varied from his relationship with the band and his own personal priorities. After that happened, the band found Mace Beyers to replace Jonathan on bass. Very shortly after that, Jason decided to leave the band as well and Bobby Benish joined Grey Daze, completing an entirely different incarnation of the band. The band has continued gigging endlessly playing all sorts of events and venues, including bars, restaurants, warehouses, private house parties, desert gigs, proving themselves as a household live band. That led them to be able to play and sell out bigger venues and open for many international acts playing in the area. Thanks to Kerry Rose's work and the fact that Mace Beyers was the Electric Ballroom's production manager, the band became the club's resident band and played a huge number of shows there until it was closed in October, 1997. In the beginning of 1996, the band asked David Knauer to produce and record their 2nd album, so he started pre-production for it on February 18th. Soon after, they got noticed by Real Records and signed a recording deal with them. Real Records was a short lived LA-based record label founded by Stevie Nicks' former manager Glen Parrish around 1995. The label existed for nearly two years with the most prominent band under its wing being Ugly Mus-Tard. Having signed to the label, Grey Daze's manager, Kerry Rose, released David Knauer from his duties saying that they were going to do the record with the label's producer and engineer, Andy Barrett and Glen Parrish, instead. The record was almost finished, but had to be shelved because Glen ran out of money to finish the studio time. Later that year, the band came back to David Knauer and asked him to redo the album. They moved forward from where they've left off, but this time, instead of working at Knauer's studio, they worked at the Conservatory of Recording Arts and Sciences in Phoenix. Just before the recording of ...No Sun Today started, Knauer got in a bad car accident. He spent the next couple months in Los Angeles and Mike Jones, the Director of Education at the Conservatory of Recording Arts and Sciences, went on to do the record instead of David. All the engineering and production work was handled by Jones and Ghery Fimbres with a help of a few students that worked on the record as their class project. "B12" and "Anything, Anything" received local radio airplay and became local hits. That time was the peak of Grey Daze's popularity as they were able to fill the Electric Ballroom with 2000+ people for their own headlining show. Sometime in the second half of 1998, shortly after their tour to Southern California that included showcases for major label executives, the band members separated their ways. Even though the band was planning to release their third CD sometime that year , the fact that none of the label executives came forward and the overall frustration over the band's seeming disability to make it to the next level has led to more personal conflicts between the band members, so Chester and Mace Beyers decided to leave the band. However, Sean Dowdell and Bobby Benish decided to keep it going and added a female singer Jodi Wendt and bassist Dave Sardegna to the band. 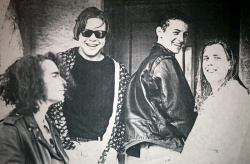 The band did a few shows under the name Grey Daze, but soon after they changed their name to Waterface with all original material written by the new lineup. After a few subsequent line-up changes that included Bobby Benish leaving the band and Oscar Bettancourth, Randy Martinez and Jay Ramirez joining them after that, the all new band was finally signed to Aezra records and released their debut album called "Seven Days" in 2000. Sometime in 2002, Bobby Benish had a seizure while driving, blacked out and totaled his truck. In the hospital, he was diagnosed with a brain tumor. Since Bobby and his family were having trouble paying his medical bills, Chester decided to reunite Grey Daze for one-off benefit show for Bobby. The show was scheduled for September 7, 2002 at the Dodge Theater in Phoenix, Arizona with several other bands. The band's line-up for the show included Chester, Sean Dowdell, Mace Beyers and Jason Barnes. On August 28, 2002, Chester was forced to cancel the benefit show because the record label had summoned Linkin Park back to the studio with Don Gilmore to record their next album Meteora. LinkinPark.com stated it was canceled due to unavoidable time constraints of recording the next Linkin Park album. In a statement posted on the site Bennington said: "It's very unfortunate that we are having to postpone this concert but our management has pulled everyone back from vacations and various activities in order to meet our recording obligations. However I will continue to help Bobby and his family at this very difficult time. I’d also like to thank the fans in Phoenix that were willing to support me in this endeavor". The show was never rescheduled. Around that time, Sean was in the process of finalizing a re-mixed ...No Sun Today with the intent to raise money to support Bobby. It would be released in June 2003 by Artemis records. The re-tracking for the this re-release was done by Michael Beck at his own studio called SoundVision that was co-owned by Sean Dowdell for some period as well. The record was remastered and re-mixed in studio, with instruments being re-recorded and vocal effects being changed. The project was ultimately blocked from public release due to legal problems with Warner Bros. Records. Bobby passed away on September 28th, 2004. This page was last edited on 11 July 2018, at 15:32.